The oldest posts, are written in Italian. If you are interested and you want read the post in English, please use Google Translator. You can find it on the right side. If the translation is wrong, please email me: I'll try to translate for you. In my previous post, I showed the chain of the locks using a query for just an instance. Recently Kaley Crum, an active member of the Orapub community, modified my statement so now you can use it in RAC configuration. 1. The column BLOCKING_SESSION and LAST_LOCKED_SESSION are composed of 2 members separated by the colon. For example, on the first line, 1:1313 mean that on the instance 1 the session 1313 is the head of the lock chain where the last element is the session 609 on the instance 1. In my company, we have more than 1000 databases and sometimes is very hard to manage all of them. So I created some scripts that help me to manage some things. Here I try to show you what happens and why Oracle updates the V$ASH view. Please read the pdf by Graham Wood, for more details. 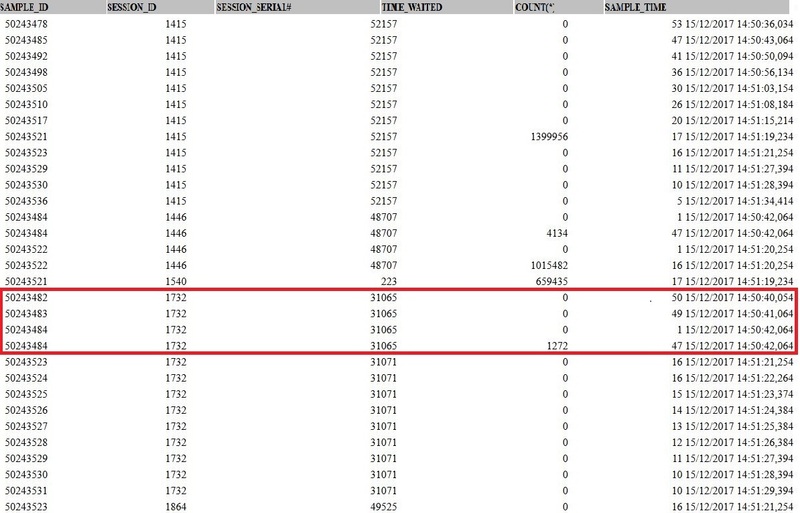 What I analyze is the session "session_id=1732" with "session_serial#=31065" saw in the previous post. Here I left the previous row, just to show what happening. you can aggregate the result. The output is here. I get an extract of this output to try to explain what happens. What my anonymous PL/SQL (see the previous post) does, is to polling the V$SESSION_ACTIVE_SESSION every second and save the output in MY_ACTIVE_SESSION_HISTORY table. Consider, for example, the session 1732/serial 31065. It appears 50 times for the snap_id 50243482, 49 times for the snap_id 50243483 and 48 times for snap_id 50243484 (see note). What happens to the session 1732, where for the sample_id=50243484 you see two distinct rows? One second after (14:50:42), sample_id=50243484, the sid 1732 wait on direct path read event, but the TIME_WAITED column is not updated. So while the SESSION_STATE/EVENT columns report the correct state of the session, the TIME_WAITED, not yet (inserting_time=15-DEC-17 02.50.43.192604 PM). Because of this Oracle update on the same SNAP_ID (50243484) this row with the correct value of TIME_WAITED column (inserting_time=15-DEC-17 02.50.44.372309 PM). Is it correct that each next sample_id, have one less? When my PL/SQL script inserts a row the first time, it does at 15-DEC-17 02.50.40.833420 PM (sample_id=50243482). The second time, it inserts at 15-DEC-17 02.50.42.016313 PM (sample_id=50243483): it inserts two seconds after the first time. The third time it inserts at 15-DEC-17 02.50.43.192604. Anyway, the last record for all samples is the same: 15-DEC-17 02.51.40.488761 PM. Because all samples end at the same time (MX column in the next picture), each of them count one record less. I'm a proud member of OraPub community. Some days ago I was speaking with Kaley Crum, another member of the OraPub community. The context was ASH (Active Session History). He told me that at some time, Oracle does an update of X$ASH in order to update the values of the TIME_WAITED column. I didn't trust him because my conviction was that Oracle makes just an insert in this X$. Well, I was wrong. Kaley right. Thanks to him to learn me something new. On this argument, what is TIME_WAITED column, and some trouble with it. Kayle wrote a post himself. Also, and I recommend it to you, a couple of post by Craig Shallahamer. You can find them here and here. And not forget the one wrote by Alberto Dell'Era. And don't miss the pdf of Graham Wood, slide 35, where he shows the fallacies of the TIME_WAITED column in the V$ACTIVE_SESSION_HISTORY view. This series of posts are based on this slide nr 35. What I want to do is try to explayn myself the problem, but here, in Part 01, I want just write the test I made. You can see the result of this last statement, here. I always receive a call where a colleague tell me that a session of an application is slow. Really that session is not slow but locked by another one. 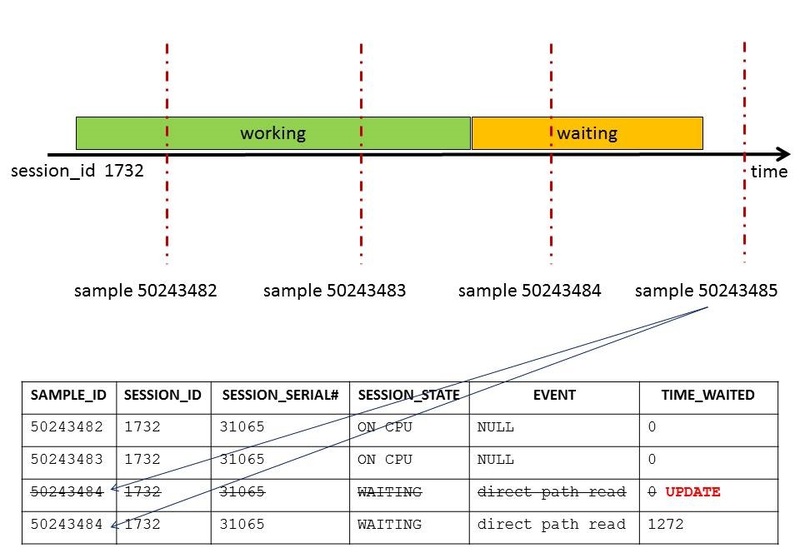 Starting with 10g, Oracle introduced a new column in the V$SESSION performance view, that report the instance number and the session id of the blockers. In this way, the troubleshooting is more simple. Anyway, after you query the V$SESSION you have to scroll down the result set in order to match the blocking session with the locked session. Because the relation between the blocker and locked sessions is of "hierarchical" type, I can use the hierarchical query (session 123 is blocking the session 234 and session 345. This last one also is blocking the session 999, for example) to try to picture this relation. There are a lot of things that seem to be strange. There are sessions that lock each other. They have the column "CYCLE" to 1. Both of them are waiting for "read by other sessions" event. This is strange because it seems to be a deadlock, but there isn't a trace file containing the "ORA-00060: deadlock detected while waiting for resource". Other curious things are the "enq: TX - row lock contention". In green, I highlighted this. The session 2330 is waiting for the session 2330 that doing...nothing. 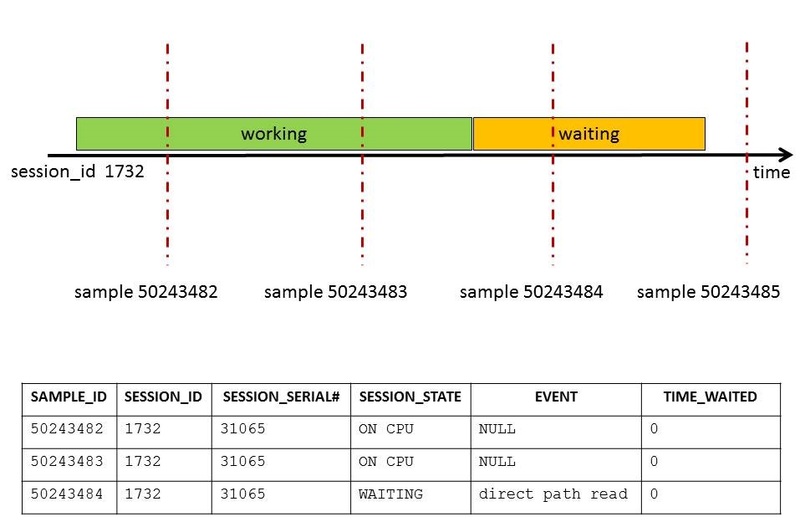 In blue, instead, you can see how a session waiting for "read by other session" depend from a session is reading the same block. 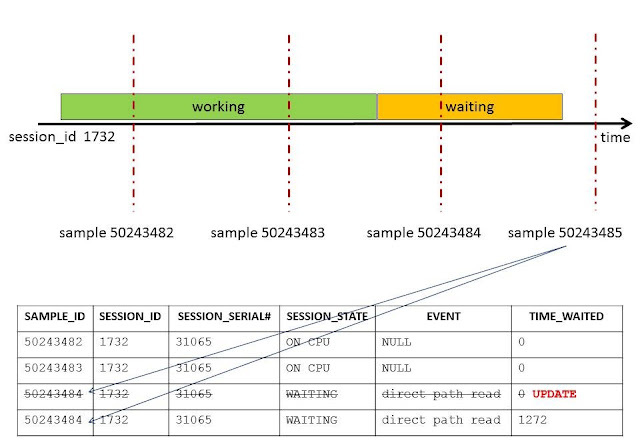 Here you can see how some sessions (in red) are locked by a session that did...nothing (in orange). In the next post, I'll show a similar statement that you can use on V$ACTIVE_SESSION_HISTOR. The column CYCLE, tell you if you have a deadlock (like in picture 01). In this case, there will be a "1"
PATH_EVENT column, show you the lock path. It includes the Session ID, the SQL ID and the wait event if that session in waiting. Otherwise, the wait event is replaced by "ON CPU"
If the SQL_ID is NULL, then I try to use the PREV_SQL_ID. In this case a "(p)" will appear (for example "2sbqfhnjz6ybw(p)" in orange in the picture 02). Anyway there are some cases where also the previous SQL_ID is NULL. In this case there will be only the "(p)" without the SQL_ID (B_SESSION = 1401, in the picture 02, for example). Introduction, Part 01: What is this? I started this series on XML because of a query wrote by Connor McDonald. Please read my previous post. Now there is just a last post where I want to talk about DBMS_XMLGEN.GETXMLTYPE. First of all the definition of DBMS_XMLGEN package. From : The DBMS_XMLGEN package converts the results of a SQL query to a canonical XML format. The package takes an arbitrary SQL query as input, converts it to XML format, and returns the result as a CLOB. This package is similar to the DBMS_XMLQUERY package, except that it is written in C and compiled into the kernel. This package can only be run on the database. As you can see, the first argument is a sqlQuery. So, in order to try a test, I just run a simple query. At this point, I run a really simple statement with DBMS_XMLGEN.GETXMLTYPE using the previous select. So, GETXMLTYPE transforms the resultset of a select in an XML. The root node is "ROWSET" while the children are "ROW". Inside this children, there are other children: one of each column specified in the inner select. At this point, you have all the instruments to correctly understand the Connor McDonald's select. From : Oracle SQL function XMLColAttVal generates a forest of XML column elements containing the values of the arguments passed in. From : You use SQL/XML standard function XMLAgg to construct a forest of XML elements from a collection of XML elements — it is an aggregate function. Numeric literals are not interpreted as column positions. For example, ORDER BY 1 does not mean order by the first column. Instead, numeric literals are interpreted as any other literals. From : You use SQL/XML standard function XMLConcat to construct an XML fragment by concatenating multiple XMLType instances. Pay attention to the "blank" in the "OracleOnw" string: it is mantained. You use SQL/XML standard function XMLForest to construct a forest of XML elements. From : SQL/XML standard function XMLAttributes can be used together with XMLElement, to specify attributes for the generated elements. The first argument to function XMLElement defines an identifier that names the root XML element to be created. The root-element identifier argument can be defined using a literal identifier. If an attribute value expression evaluates to NULL, then no corresponding attribute is created. The data type of an attribute value expression cannot be an object type or a collection. to_char(CREATED, 'dd/mm/yyyy hh24:mi:ss') as "When"